3. URL of spoof website obviously not PayPal. 4. URL disguised as text " Please click here to update and review your Paypal Profile ASAP ". 5. Website traced to Texas, USA.
" 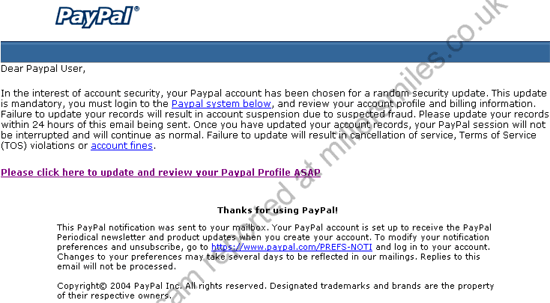 Dear Paypal User, In the interest of account security, your Paypal account has been chosen for a random security update. "